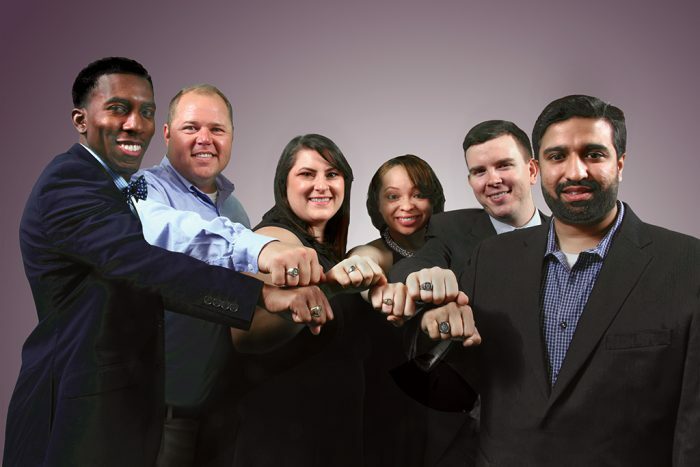 Atijah Collins, Robert Lancaster, Lyn Wilson, Dana Thomas, Michael Ridlehoover and Ahmad Bhatti. Photos by Phil Jones/Rings courtesy of Jostens. 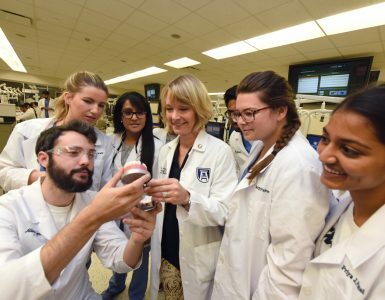 Dr. Michael Ridlehoover has boundless pride in his alma mater’s internationally renowned reputation. Thanks to him, he and his fellow alumni can now demonstrate that pride everywhere they go. The symbol Ridlehoover had in mind was one that would enable DCG alumni to recognize each other at a glance, helping cement bonds with old friends and forge instant connections with new ones. “I wanted us to have a class ring,” he says. Lefebvre loved the idea and immediately set it in motion, forming a committee to draft a design. She had previously also formed a committee to create a seal for the newly renamed college, and Ridlehoover was appointed to sit on both. He’s had professional experience with design as well. “I’ve done some graphic design in the past,” he says. In designing both the seal and the ring, he drafted several ideas. Then he and his fellow committee members passed the concepts along to students, seeing what they liked and incorporating their feedback and ideas. 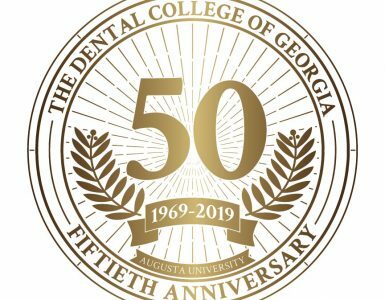 First to be unveiled was the seal, with components including a torch representing education and research; the pediment of the Old Medical College representing the heritage of the university’s Health Sciences Campus; 32 leaves representing the number of teeth in permanent dentition; eight sundial markings representing DCG’s eight residency programs; a serpent as a variation of the symbol of Aesculapius, the Greco-Roman god of healing; and the founding year of 1969. Committee members and the rest of the DCG community were thrilled with the result, which debuted this spring. Lefebvre and her faculty take great pride that as the college, now 48 years old, continues to evolve, its symbols and traditions are growing as well. “Traditions and rituals play a large role in establishing a sense of community, a sense of family, and we love knowing we’re helping to create a rich reservoir of memories,” she says. The new class ring joins other traditions and rituals that bring the DCG family together and create community and continuity throughout the college’s history. We showcase a few of them on these pages. This is a university-wide fall event, “but we put our own spin on it,” Carole Hanes says. 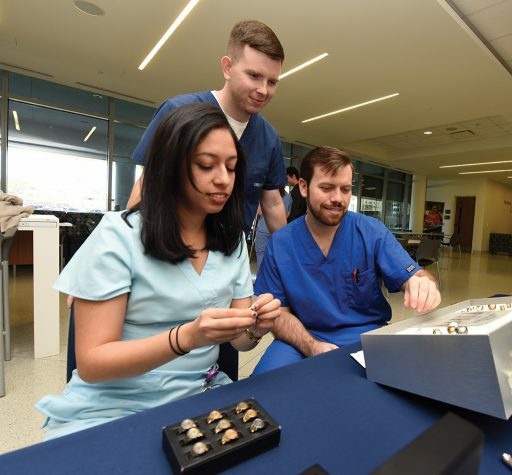 Events for family members of first-year students include tours, presentations and hands-on experiences in the dental simulation lab. 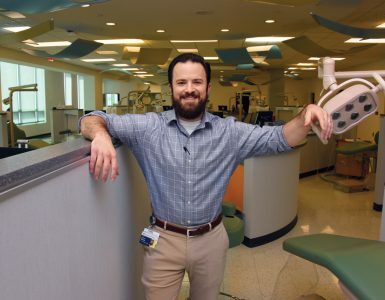 “This takes place during our new students’ first semester, so the visit enables family members to visualize their child in our dental environment,” Hanes says. This event, honoring graduating seniors, generally takes place on the same day as the university-wide commencement ceremony. “It’s a welcome-to-the-profession ceremony and really, really special,” Carole Hanes says. During the ceremony, the students are led in by a faculty member they have chosen to receive the Judson C. Hickey Award, named in honor of the DCG founding dean. The award honors the faculty member senior students deem has been the most influential during their education.